College is stressful and definitely does not spark joy for most undergraduates; however, one of the greatest advantages of being a college student now is the incredible amount of technology you have access to. Whether it’s remembering your schedule or building your portfolio, there are so many incredible things you might not know about that will make your life much easier. Here are some of my favorite things that I have discovered to help you keep life organized. While this is most likely common knowledge, the UC San Diego App is probably the most practical one on my phone besides Facetune. Once you sign in, it displays your schedule, which, if you are anything like me, you need to look at every 10 minutes to make sure you don’t get lost. It also has other cards, like Parking Lot Watch (right now it only covers one lot but it is being updated) and Dining Hall menus, that you can customize to your preference. 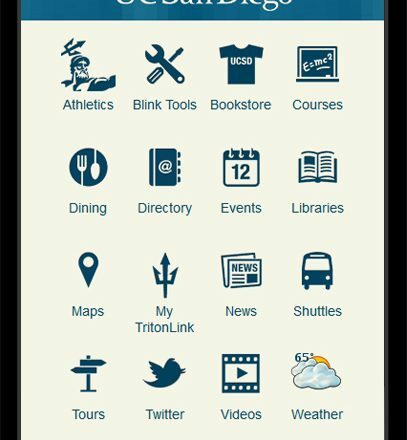 The app covers all the essentials that a UCSD student could need. This is the free carpool app that is provided for by the Community Service Officer Program. If you download the TapRide app and sign up with your student email, it will allow you to request a free ride between 8 p.m.-8 a.m. As long as the pickup point originates on campus, you can request a ride up to 10 miles from UCSD. This service is perfect for when you have a late night discussion or study session at Geisel Library, and you don’t want to take the bus. Throughout Price Center, there are several phone charging stations for iPhones and Androids. I know of the ones in the Commuter Lounge, next to Bombay Coast, outside of Price Center Ballroom West, and the lobby of Price Center Theater. The one in the Commuter Lounge is just multiple exposed wires but the others are a lockbox. You simply put your phone in, set a four-digit password and go off to class. When you return, just punch your code in and it will be fully charged and ready to use. This is perfect if you are an anxious commuter like me and need to make sure you have enough charge to open up the new San Diego Metropolitan Transit System app. On the second floor of Geisel is the most slept-on resource on campus. Students have access to a 3D printer, VR Headsets, and computers with Adobe Creative Suite and CAD software. This is a perfect opportunity to build your portfolio with start-up ideas and try your hand at prototyping. But if you don’t feel like making the hike to Geisel from off-campus, you can get a discount on Adobe Creative Cloud with your student email. While college might be stressful, remember all the incredible resources that you have access to. This is just the tip of the iceberg I’m sure, but hopefully it will pique your interest enough to make you consider using technology for more than binge-watching Marie Kondo and making memes.